On 15 January, Director-General nominee Bernard Bigot, ITER Director-General Osamu Motojima, System Engineering Group leader Sergio Orlandi, and several Domestic Agency heads visit the new vacuum lab in the basement of ITER Headquarters. Literally and figuratively, vacuum is a large part of ITER. At the heart of the machine is a 1,400 m³ vacuum chamber where fusion will take place. And this, in turn, is enclosed within a much larger vacuum vessel (the cryostat, 8,500 m³) that acts much like a thermos to keep the cold in. Vacuum is key to ITER operation: a submicron crack in a vacuum vessel weld, a puff of particles released by a component's surface or bulk ("outgassing"), or a less than perfectly tight valve are enough to alter the vacuum quality and degrade machine performance. Leaks and outgassing are the enemy, and it's up to the ITER vacuum group to keep them at bay. Some 18 months ago, the Vacuum Section began testing vacuum component and material samples in a temporary laboratory made available by the neighbouring CEA research centre. 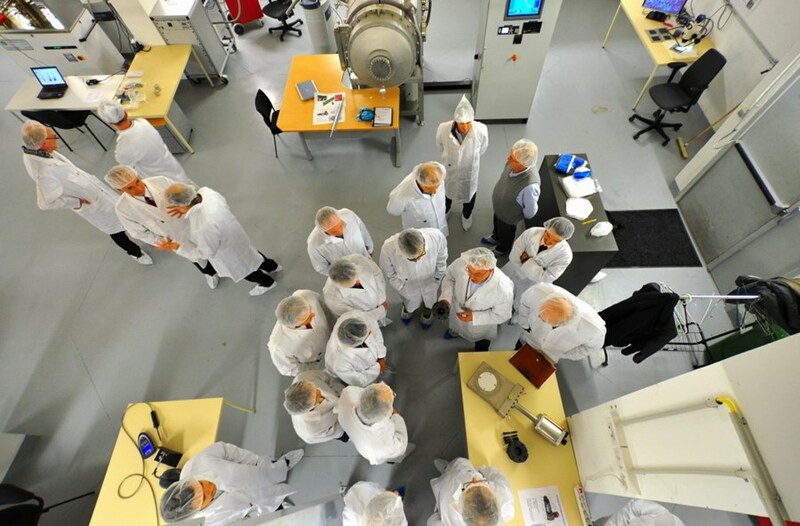 As more and more vacuum components were delivered to ITER, however, the need for a new on-premises facility became evident. 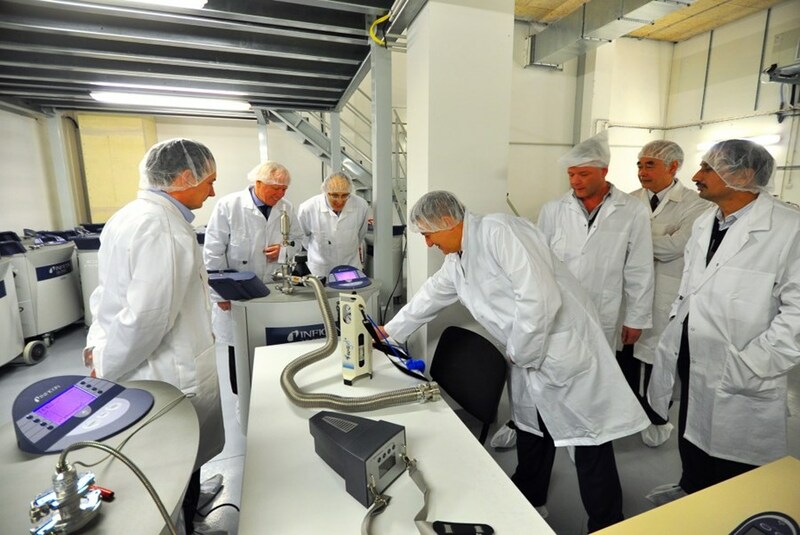 As a result, at ITER Headquarters a basement storage room for discarded hardware was transformed into a fully functional laboratory with component and material qualification equipment. "We have a mandate to assure vacuum quality," explains Liam Worth, the group's Vacuum Design and Construction Officer. "This means scrupulous component testing and the careful qualification of the materials that will go into the machine." In the ITER environment, components and materials will be exposed to very harsh conditions. A material's mechanical properties, or even vacuum compatibility, might be well known and documented but its behaviour in a hot plasma environment must be investigated and qualified. A 1 m³ vacuum tank, an oven, equipment to measure even the lowest outgassing rate, helium leak detectors, and other highly sophisticated rigs will be used to ensure that all vacuum components and materials meet project requirements. The same goes for components. Valves, diagnostic equipment, vacuum gauges—many of which perform a safety function—must be qualified in ITER-relevant conditions. "As part of our commitment to minimize cost and maximize efficiency, we will standardize components for use on ITER vacuum systems," explains Robert Pearce. "In addition to component qualification and material testing, we aim to offer practical training in vacuum testing, specifically leak testing, which are essential for component acceptance at the factory," adds Pearce. "It is our goal to ensure that our ITER Organization and Domestic Agency colleagues have the competencies required to ensure the vacuum performance of components." The basement vacuum laboratory was inaugurated on 15 January with equipment demonstrations and talks given by Vacuum Section members. "This is a demonstration of what can be achieved with limited resources and a pragmatic approach to problem solving," says Jean Louis Bersier, the responsible officer for the vacuum laboratory.